1. I watched “Intervention” on Monday and it was the usual. “My name is Brooke / Steve / Vanessa and I am addicted to meth / Oxy / huffing Febreze / whatever.” Followed by footage of their crappy life on drugs. The super-bummed-out family tells how he / she was a precious little angel as a child. One of them inevitably says, “Always smiling, always happy.” The drug enthusiast who is the focus of this particular episode makes a comment about how they don’t know how they’re going to go on like this, and if they’re on an opiate they doze off while they say it. Cut to commercial. It’s the same every time. But something stood out for me on this week. The chick was addicted to black tar heroin and had been for five years, since she was sixteen. I was impressed with her. She was practically an advertisement for the stuff. She looked great (aside from the slurring of the words and the small weird bumps on parts of her arms from injecting in one place too much) and her description of how heroin feels, mmmm, it sounds delicious. Something about warm honey flowing through your veins – I wanted to whip out anything that could be construed as a tourniquet right then. (Relax, I am not going to start dancing with Mr. Brownstone. Everyone stay calm.) But that’s not the thing that stood out. At one point, they talked about how she’s homeless and sleeping on the street with her boyfriend, and then they showed her wearing a white shirt. A white shirt that is white. Following that they showed her shooting up in the white shirt, which remains white. I wear predominantly black because of a variety of reasons, but one of the main ones is that I find it damn near impossible to not stain my clothes with soy sauce or any other food I might place in my mouth. It will, guaranteed, end up on my boobal area. So I am to understand that a homeless heroin addict who is making pinholes in herself that then cause her blood to leak out is more capable of keeping her clothes clean than me? Because that’s what I’m taking away from this. And gosh darn it, if that don’t make you feel bad about yourself, I don’t know what will. 2. Eels! Specifically moray eels. They give me the heebie-jeebies because their mouths extend too far back, or maybe their eyes are too far forward and close to their nose, one of the two. I was watching a special on them recently and thought they had reached maximum creepitude but I was incorrect. Scientists were wondering how the moray eel pulled its food into its mouth and throat, and through careful scientific study it was discovered that the eels have a second set of jaws that pop out, grab the food and drag it inside which, I don’t know about you, is one of the most horrifying things I have ever heard. Want to see some video of it? Think carefully before you answer that. 3. In honor of ten years of dating, I forced Cricket to express his love for me through a sparkly object I can wear on my hand. I love this ring. It’s big, it’s old, the stone is an antique cut, it’s platinum, and it’s got rubies (my birthstone) all around the edge set in gold. The first few weeks I had it I couldn’t stop looking at it, so my co-workers nicknamed me Gollum. And when we moved to our new offices this last week, A small Gollum figurine managed to make its way onto my desk. 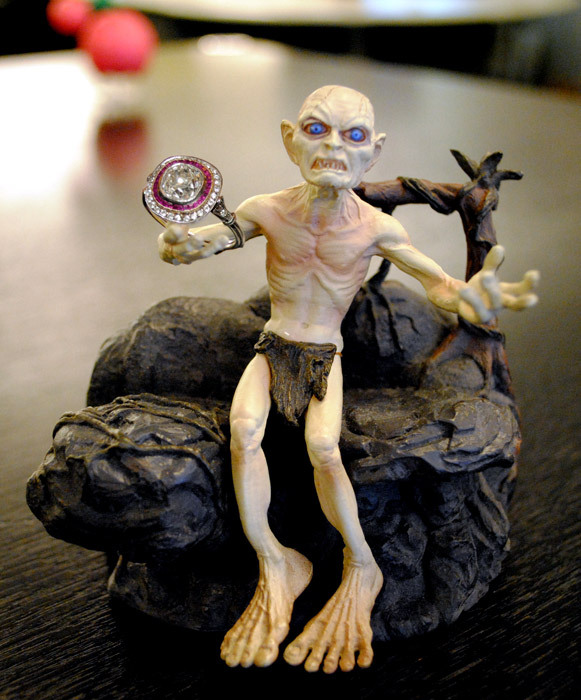 I took a picture of my ring with Gollum holding it. It just seemed right. This entry was posted on Wednesday, January 11th, 2012 at 9:37 pm and is filed under Advertising, Nature, Stuff, The Telly. You can follow any responses to this entry through the RSS 2.0 feed. You can leave a response, or trackback from your own site.